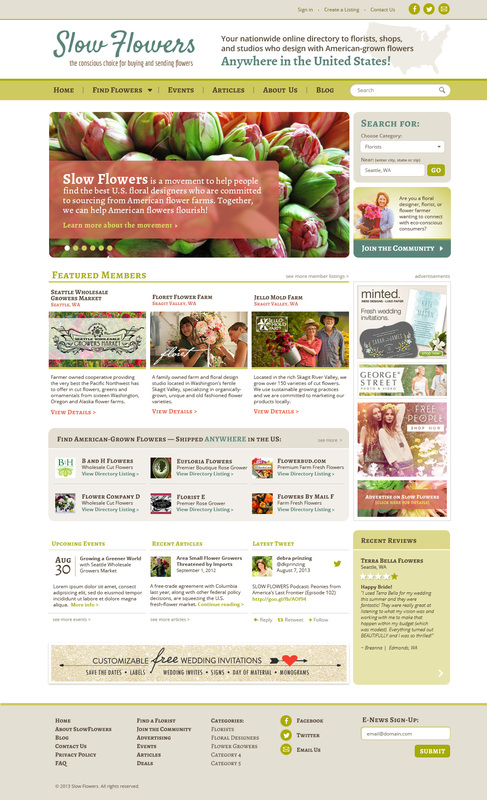 Here is the sample Home Page for the Slowflowers.com site. SAMPLE GRAPHICS are used as a place-holder only and do not imply endorsement. I’m in the midst of raising money to help fund the launch of Slowflowers.com, a brand new, essential resource that will help connect consumers with American flowers and the people who grow, design with and sell them. I’ve been living and sleeping flowers, dreaming about this project coming to fruition for so many months, more than a year, really. And the exciting news is that donors to the Slowflowers campaign on Indiegogo have already contributed more than one-third of the $12,000 goal to this campaign in just four days. I think that’s remarkable. On this pace of $1,000 in donations per day, the goal will be met well before the 45-day deadline – and that means we can launch even sooner! Flower farms preserve open spaces and agricultural land. Like this 7-acre patch of heaven in Mt. Vernon, Washington, home to Jello Mold Farm. Imagine, a new economic floral industry in Alaska! 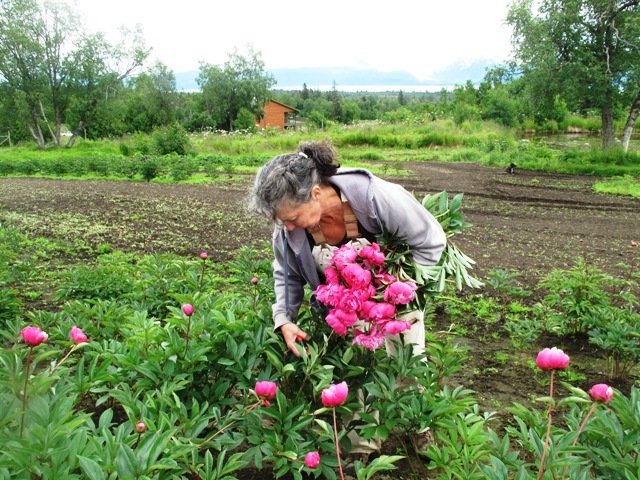 Here’s farmer Shelley Rainwater harvesting her beautiful peonies in Homer, Alaska. 3. By supporting “American Grown” flowers, you are saving the family farm and the very notion of making one’s living from the land. Agriculture in America is alive and well, especially when we can support farmers young and old in making their living from their land. Gretel and Steve Adams of Sunny Meadows Farm outside Columbus, Ohio. 4. By supporting American flower farms, you are ensuring the diversity and variety of choices in the marketplace. 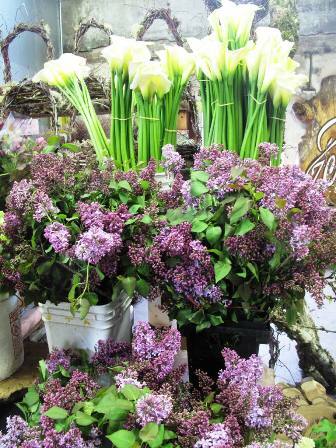 Field grown calla lilies and heady lilacs – Oregon grown and amazingly beautiful, fresh and healthy. 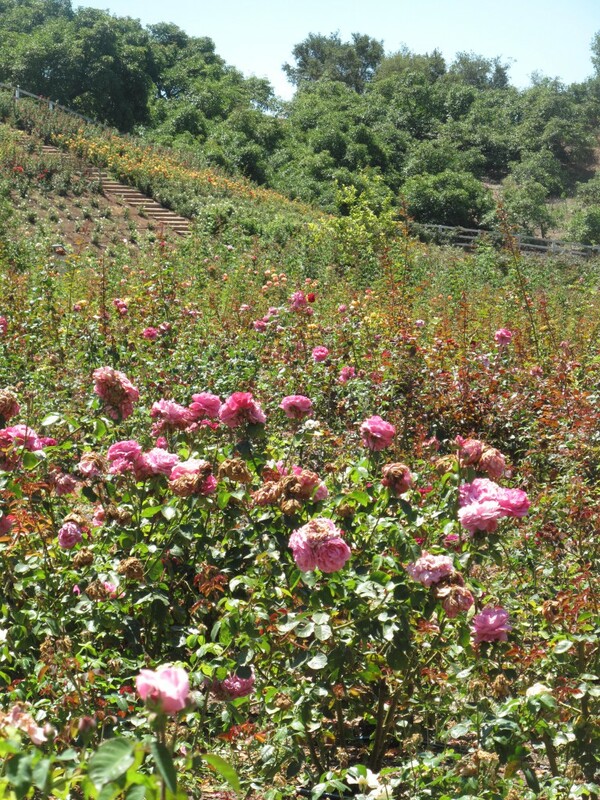 Field-grown old garden and English roses from Rose Story Farm. Hard to resist! 5. By supporting American flower farms, you are giving conscious and creative supermarket floral buyers A CHOICE about where they source their flowers, too. 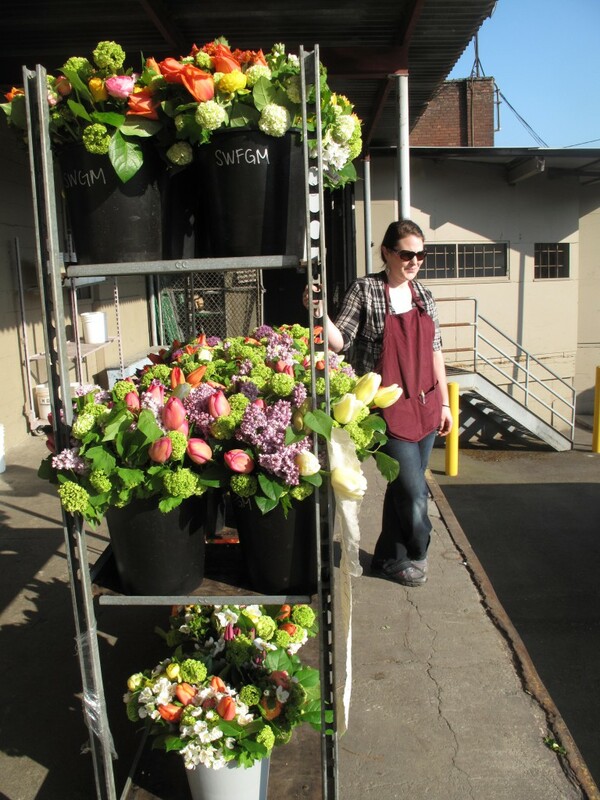 These Northwest flowers are on their way to the Town & Country Supermarket chain where buyers and their customers CARE that their flowers are locally grown. 6. By supporting American Flowers, you are helping to RECONNECT florists with flower farmers – and when that happens, beautiful things emerge! 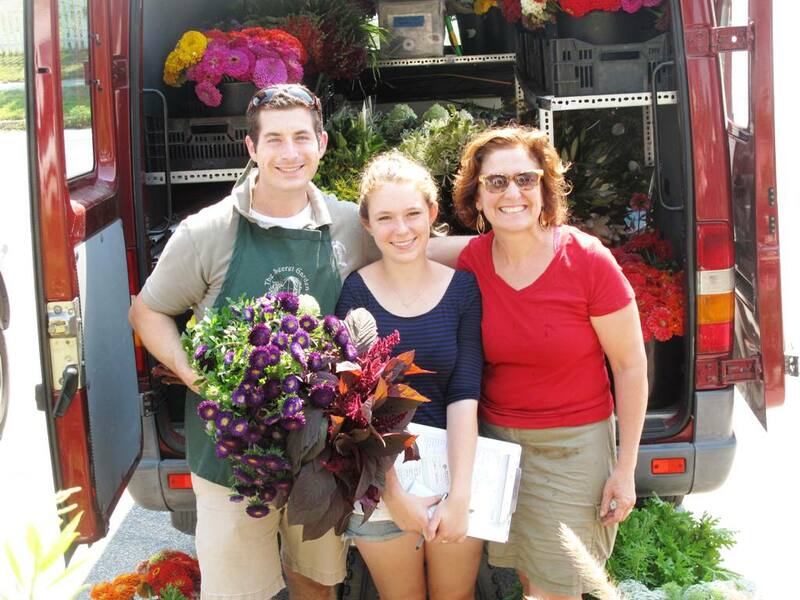 Polly Hutchison (right) of Robin Hollow Farm in Rhode Island makes weekly deliveries to David Urban (left), owner of The Secret Garden – an appreciative customer. 7. By supporting American Flowers, you are making it possible for farms to share their story with consumers, many of whom may never before have visited a flower farm or greenhouse! 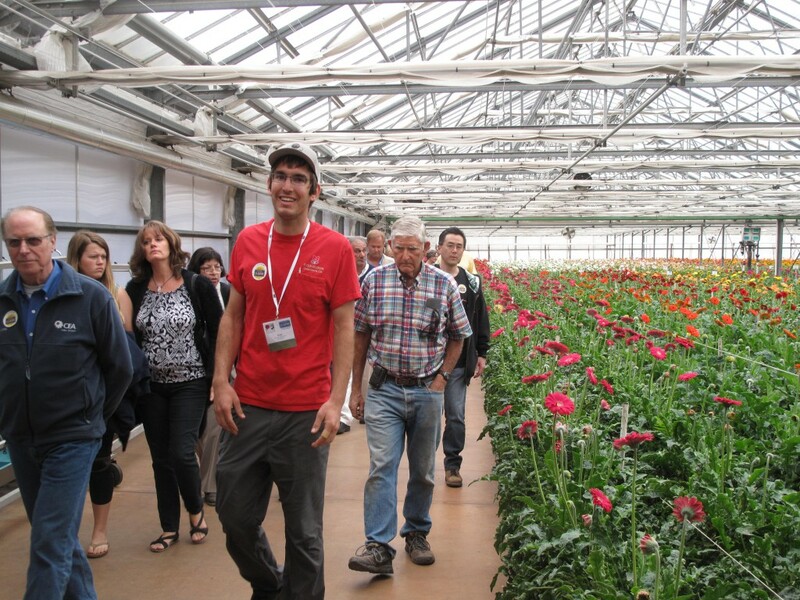 Ivan Van Wingerden of Ever-Bloom in Carpinteria, California, tours visitors through the gerbera greenhouses during the annual open garden event bringing consumers to flower farms. 8. 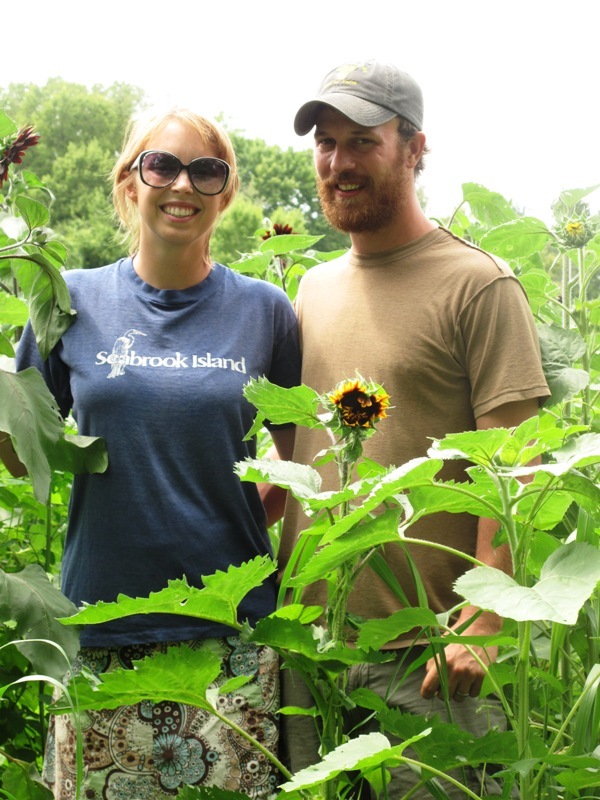 By supporting American Flowers, you’re making sure that LOCAL FLOWERS are part of the FARM-TO-TABLE story! 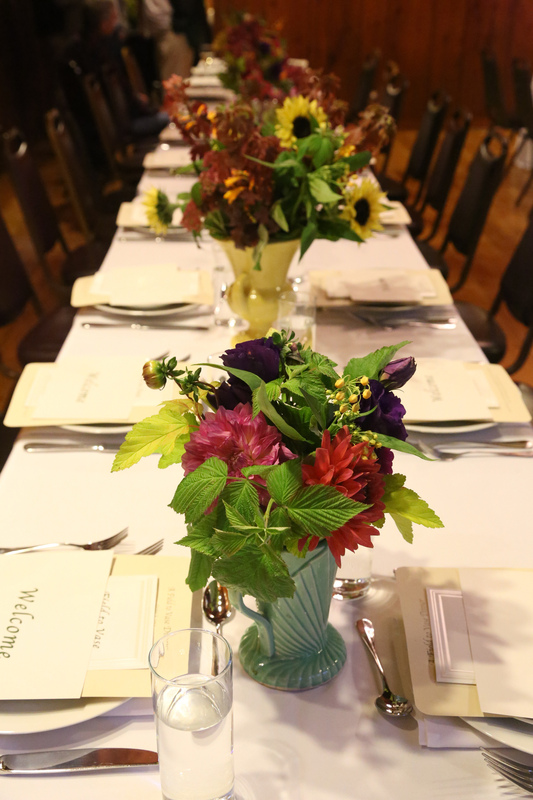 Flowers are an important item on the farm-to-table menu! 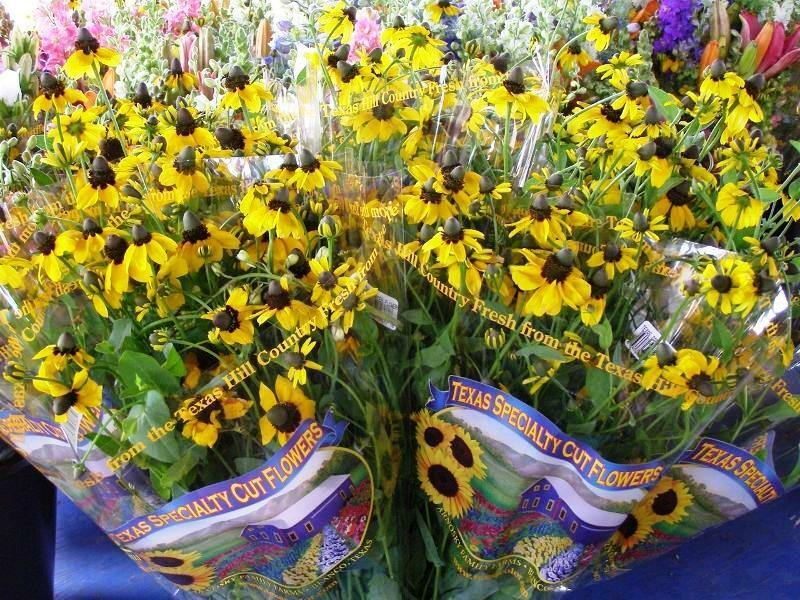 Thanks to honest labeling, there is no doubt that these flowers were grown by local farmers in their local community. 10. By supporting American Grown flowers, you’re putting more flowers on the table, one vase at a time. You’re saving an industry that has been long-neglected by its own elected officials. You’re changing the dialogue and elevating the design aesthetic for the flowers you give to celebrate, congratulate and share love. It’s a patriotic notion and an important way of life for generations of Americans. Tell me . . . WHY do you want to Save American Flowers? This entry was posted on Thursday, January 9th, 2014 at 10:04 am	and is filed under American Grown, Blog Posts, floral design, General, Slowflowers.com the Directory of American Flowers. You can follow any responses to this entry through the RSS 2.0 feed. You can leave a response, or trackback from your own site. 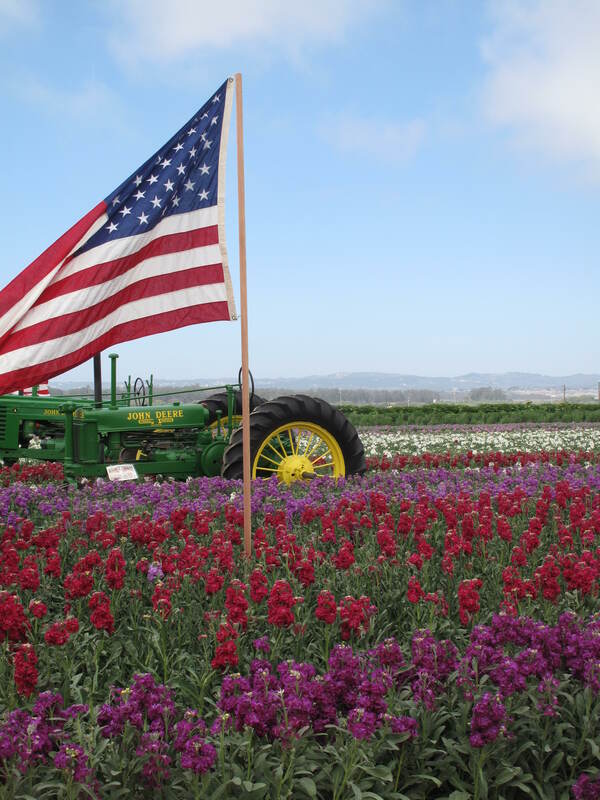 Supporting Local Flowers indeed supports America… our Future, the Economy and our own personal Well Being… It makes good sense to support Local American grown Flowers! Buy supporting American Grown Flowers you are supporting more sustainable environmental choices. Flowers shipped from overseas are usually grown with more pesticides and all are shipped with lots of packaging which ends up in U.S. Landfills. A dear friend of mine worked in the floral business for years and came down with mercury poisoning. She is part of a huge class action suite with a national grocery chain. Years of contact with shipped in flowers. I believe American-grown flowers are important because at a time when we have outsourced most of our goods, it is important to remember what we can grow in our own backyards. Our country is full of all kinds of diversity, in humanity and ecology. We shouldn’t have to look out of these 50 states to find beautiful flowers. The preservation of farmland and American farming heritage is definitely in our minds as we grow flowers in an area of crushing development, yet equally important to us is preserving and/or reviving “garden” flower varieties for our own designs and the delight of our customers. For many, our first experiences with true beauty in the natural world stem from forays into the garden, our first understanding of color, proportion, scent, texture. 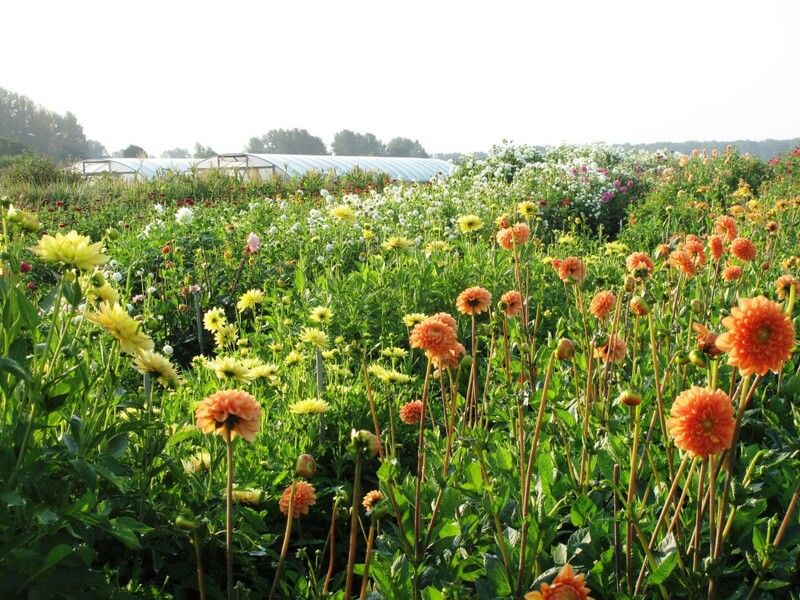 Growing, nurturing and in some cases re-introducing these often delicate varieties to an industry overwhelmed with only those that “ship well, last well, work well in foam” helps drive this flower farmer. We want to ensure that the child that learns, dreams, and creates in the garden, is always able to find them, available to give, share, design and remember them at any age. Once a very elderly southern gentlemen, was led into our market stand. Generations of his family patiently stood by as he admired, touched, smelled our flowers. To my surprise he started to cry, turned to me and said in the most delightful southern drawl “I haven’t seen sweet peas since I was a boy.” It’s been 8 years since that day, many thousands of blooms, many new varieties, many similar stories later. We still try to grow our beloved sweet peas each year, with varying degrees of success in Virginia’s unpredictable spring temperatures. We grow them for a host of reasons, but mostly we grow them hoping that one day our friend, and others like him, will return in each spring and remember…. By supporting American Flowers, you send a powerful message on your Wedding Day. The seasonal bouquet you carry will be a collection of all that is lovely, fresh and full of hope on the day you get married. It is a poignant reminder of all that was beautiful on this one day, in this one season, on this Planet Earth, in this one suspended moment of happiness that you and your loved ones all share. American flower farmers are fortunate to have such an advocate. The success of your campaign is inspiring to many and I’m looking forward to your successful launch of SlowFlowers.com. Keep up the great work Debra! I think it’s also important to consider the non-human beneficiaries of flower farms-pollinators, especially! Biodiversity is good for everyone. I’ve been working for a traditional florist for 16 years, and am a little late to this party, but I’m loving learning more about what’s available closer to home! I’m so very inspired by all of you amazing designers and advocates for American flowers!Bravo!It gets tricky growing flowers in our Central Texas landscape so CA grown is the next best for this Go Local Gal! Natasha´s last blog post ..Hi, my name is Alicia, and I love flowers, too! QUALITY! – For floral industry professionals, American grown flowers represent the highest standards of quality and freshness.